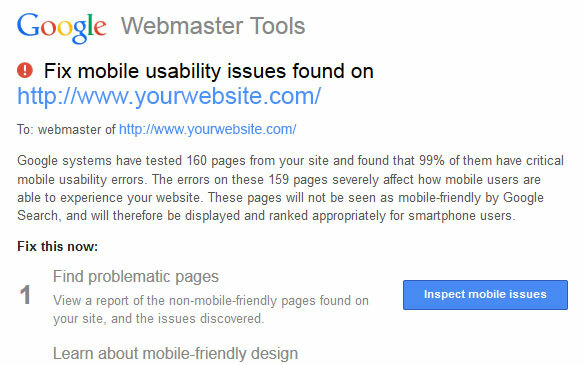 Have you recently received an email from Google Webmaster Tools that reads: Fix mobile usability issues found on http://www.yourwebsite.com? If so your website is probably not responsive and was developed prior to the days of response design. As the email indicates: The errors on these pages severely affect how mobile users are able to experience your website. These pages will not be seen as mobile-friendly by Google Search, and will therefore be displayed and ranked appropriately for smartphone users. On other words a website without responsive design will affect its placement on search engine result pages. Response design or responsive design; a flexible design whose layout modifies for each platform that it is viewed on be it a desktop, laptop, tablet or cell phone. If you have a non-responsive website and your site is a WordPress developed website, the easy fix is to install a plugin that will convert your website into a responsive website. The popular plugin, Jetpack, gives site owners the mobile-friendly features of hosted wordpress.com with your self-hosted site and includes the feature Mobile Theme. There are a number of other plugin options too. Learn more about how to customize your website to be mobile friendly. Learn more about how to customize your website software in WordPress. If your website is incurring mobile usability issues and you are not sure how to proceed, consider contacting Creative Developments for a solution to this problem.